After revealing our nursery and a couple of features in some of my favorite blogs, Ohdeedoh and MadebyGirl, I got some emails and comments asking questions about the nursery. I'd really love to reply to each of them, but as you can imagine, baby G is keeping me busy. I was planning on posting this breakdown before baby G was born but never finished it. Well, now I finally did. I hope this answer some of your questions. And by the way, thanks so much for all the nice comments guys! I didn't get all the items and accessories from the board, since some things looked good online but in person where not that great (like the rug, that turned out to be too rough). Also I found other things along the way that fit the space and our budget better. 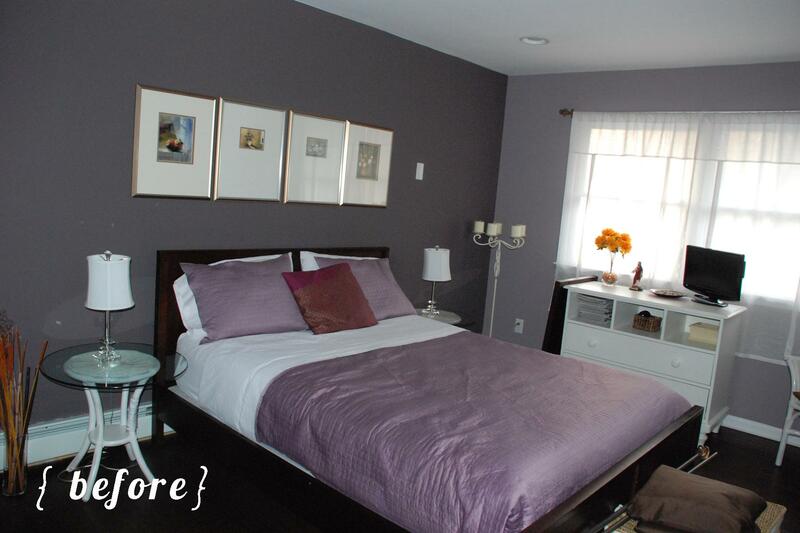 This is a before photo when the room was the old guest bedroom. 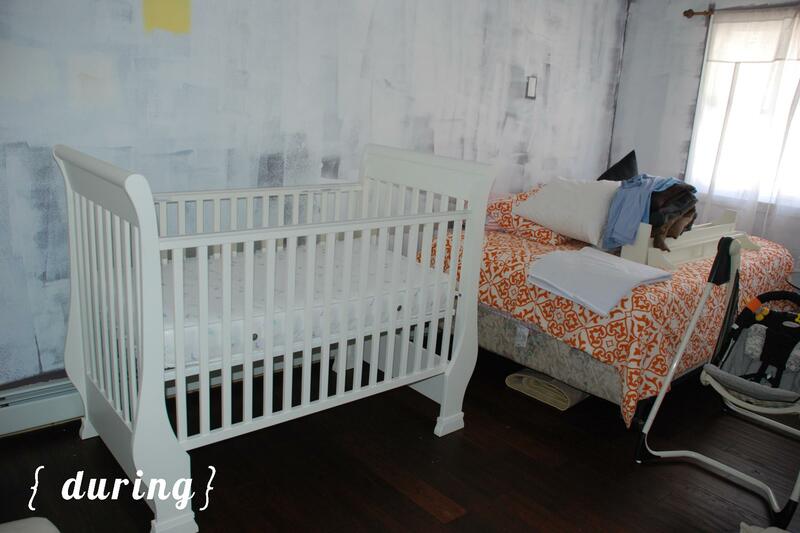 As you can see we re-used some pieces of furniture from this room, like the wicker white table (without the glass top), some of the frames above the bed and of course the changing table, that we were using as a dresser. This is an in-between picture. I thought it'd be good to keep it real and show you how the room looked for months. It drove me crazy! And finally the after shot. Here I talked about the floor layout so you can have a better idea of where things are. We didn't have to buy any piece of furniture. 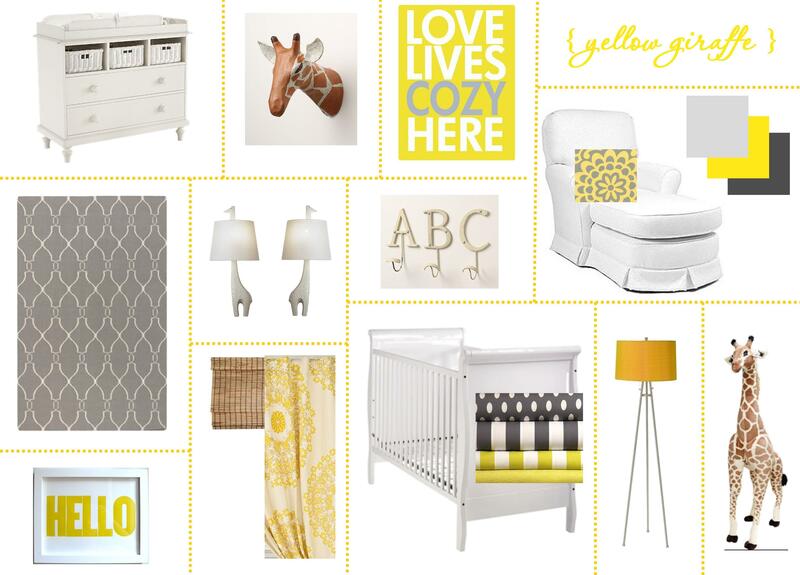 We had L's crib, changing table and rocker, all from Pottery Barn Kids. We actually got a brand new crib as a replacement for L's crib. We were missing some hardware and when we called to ask for it, PBK said they would send us a replacement instead. A whole new crib! For free! That was baby G's first gift! We had the full bed from my old apartment. I wanted it to look more like a day bed, so I added lots of pillows. The frames above the bed were the ones in the old guest bedroom. Since they were a gold color I applied some Rub 'n Buff in silver to coordinate with our color scheme. The night table was a hands-me-down. I found the cute elephant lamp in Marshalls. The little giraffe plate is from Pier 1 Imports (on sale for $1) and the cubes I borrowed from L's room. I love the wrought-iron tricycle that we found in my mother-in-law's basement. It was a thrift store find. The cute knitted blanket on the rocker belonged to the mister! As you can notice there are lots of giraffes toys. Once my mom and mother-in-law knew about our giraffe theme, they started buying everything giraffe. By the rocker I decided to create a little reading corner so I added two shelves we already had. The top shelf has Spanish books that were presents from my Peruvian friends and a framed photo that everyone signed at my shower in Lima. The bottom shelf has some English books, some artwork I download for free and a ceramic giraffe. I spent a lot of time looking for the perfect rug. I wanted something with pattern and texture. Unfortunately not all things are as good as they seem on a computer screen. I'm glad I went to see some of these rugs in person before buying them. The main problem with all of them: there were too rough. I finally found a simple grey rug in Overstock. It appear to have a little texture and the reviews were good. For $40 bucks I thought I couldn't go wrong. If I didn't like it I could place it somewhere else. With the sheepskin rug I got from Ikea, was the perfect combination. The mirror by the changing table was also a last-minute change. I had a circle mirror, from Ikea too, that I wanted to use, but I couldn't find the hardware to hang it. On a trip to Homegoods my mom found the rectangular mirror and was instant love. I think the most expensive thing in the room is the closet storage system. The mister had to cut some of the shelves to adjust them to our space but it all worked out. I initially wanted the Elfa system from the Container Store, but after seeing their almost $800 estimate I did a little more research and found the Antonious system from Ikea. Very, very similar system and less than a third of the Elfa price. You can't beat that. Here, here and here I talked about all the DIY details in the room. saved didn't spend a lot on the room, I got to splurge on my amazing diaper bag! I love, love that bag! Fabric for pillows: Etsy, Ikea, JoAnn & Fabric.com - $8.99 /yard approx. Closet Storage System: Antonious - Ikea $ 230.00 aprox. Hi Tania, thanks for stopping by. Here I talked about how we did the wall. I'm not that good at giving directions or tutorials, so let me know if you have any other questions. Hope that helps! Love-love the finished product! So cute and stylish! where can I find a tutorial on the chevron stripe paint job? we did a horizontal stripe all over the other nursery, and I think 1 wall is all we can deal with this time - so I want to make it count!! just gorgeous! Hi Jill, thanks for stopping by. 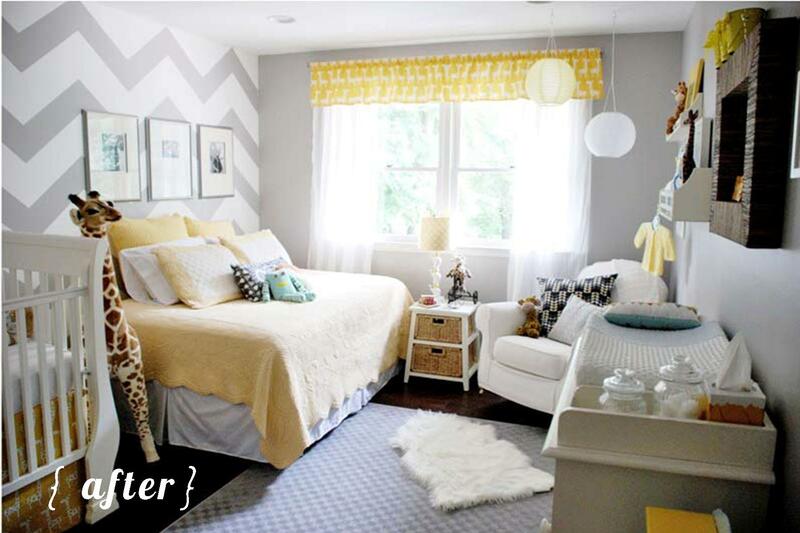 I posted about how to do the chevron wall here. And there are a couple of links to other tutorials, too. Hope that helps. Where did you buy the frame you used for the Love Lives Cozy Here print? Thanks so much!!! I love this room!!! !